And there she is is in all her glory. 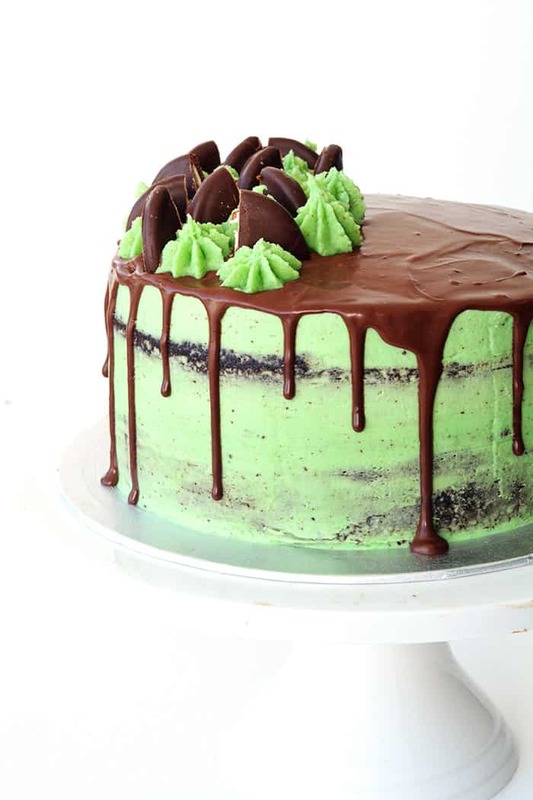 A big beautiful Mint Chocolate Layer Cake overflowing with all things mint and chocolate. Let me break it down for you. 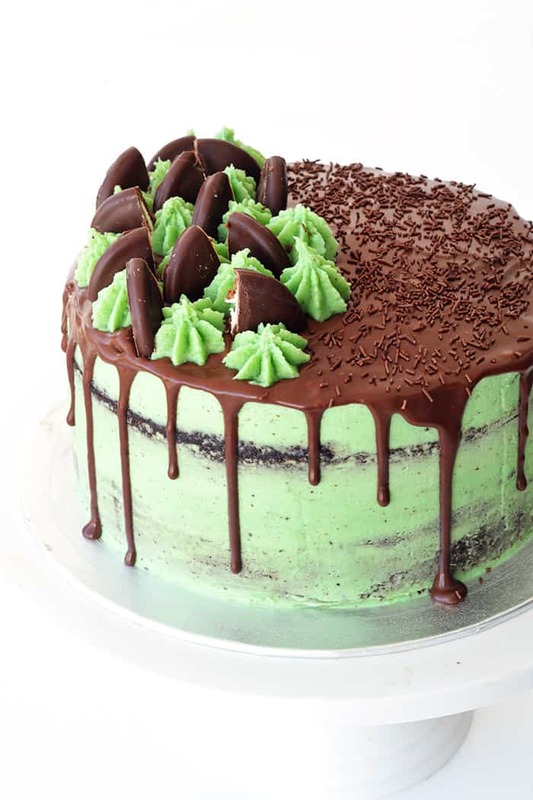 There are two glorious layers of super soft and fluffy chocolate cake (the kind you can eat without frosting it’s THAT good), a smooth coating of creamy mint buttercream with real chocolate flecks, a generous drizzle of dark chocolate ganache AND a gathering of choc mint cookies. Oh boy. Remember my Mint Chocolate Cupcakes? This cake is like them but BIGGER. So Much Bigger. But still filled to the brim with that gorgeous mint chocolate flavour that we all know and love. Do you like the look of naked cakes that are only lightly frosted on the outside? I adore them so couldn’t help myself with this cake. To easily achieve that crumb coat look, I recommend getting a cake scraper – it will change your world. A cake turntable will also make your life easier. It’s my birthday this week and I’m trying not to freak out that I’m turning 29. TWENTY NINE. Where in the world did my twenties go? I’m trying not to dwell on the number but instead enjoy all the joy that birthdays bring. I was able to celebrate with my family on the weekend and I had the best time. My parents love to celebrate, especially birthdays. We played games, ate cake and I was blessed with beautiful presents. I’m also looking forward to a few more birthday celebrations this week. And you know what that means – more cake! My husband is taking me out to Jamie’s Italian for dinner, which is totally fitting because I love Jamie Oliver and Italian food! I hope you have a wonderful week. If you’re on the hunt for a lovely layer cake for a birthday or celebration can I be bossy for a minute and tell you to make this one? It is just TOO good not to share. I means there’s cake, there’s cookies, there’s chocolate ganache. It is over-the-top and yet simple in flavours. And even though layer cakes always take time, my guess is this cake is probably easier than you think. 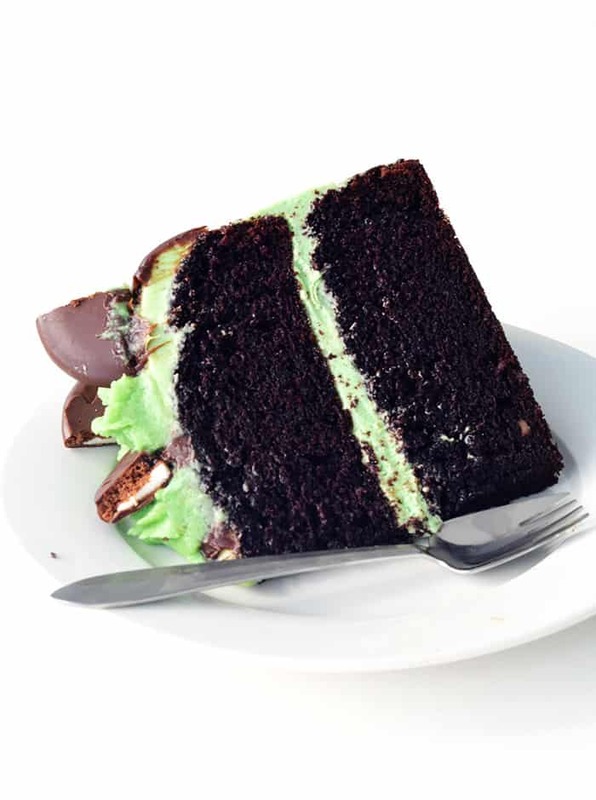 On the other hand, if you love the idea of a mint chocolate cake but are short on time, you could try my one layer Mint Chocolate Cake that’s as easy as can be! 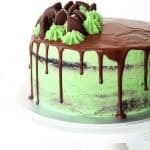 Two layers of soft chocolate cake frosted with mint buttercream and drippy dark chocolate ganache. Preheat your oven to 180 C (360 F). Grease and line two 8 inch round cake tins with baking or parchment paper. In a large mixing bowl, sift the flour, cocoa powder, baking powder and baking soda. Then add the sugars. Whisk together. In a separate mixing bowl, add the buttermilk, vegetable oil, vanilla and eggs. Whisk together. Boil the kettle and pour out 1 cup of hot water. Add the wet ingredients to the dry ingredients. Start to fold together, slowly pour in the hot water, and continue to mix until all the ingredients are incorporated. Divide the mixture into two cake tins and bake for approximately 30 minutes or until a skewer inserted comes out clean. Leave for 10 minutes before gently removing the cakes from their tins and leave them to cool completely on a wire rack. To make the mint buttercream frosting, add the butter to a large mixing bowl and beat with an electric mixer until pale and creamy. Gently sift in the icing sugar, one cup at a time. Add a tablespoon or two of milk to help loosen up the mixture. Then add the mint extract and continue to beat. Add a tablespoon or two of milk if needed. The icing should be nice and creamy but quite thick. Add the grated chocolate flecks and stir through. To frost the cake, you may want to level the chocolate cakes first. I use a cake leveler to do this. Then place your first cake on a cake turntable on a disposable board (to make it easier to move once frosted). Gently cover the top of cake in frosting, then add your second cake on top. Frost the entire cake, top and sides. Use a cake scraper to remove excess frosting from the sides (if you want the naked cake look like I did). Once you are happy with the cake, pop it into the fridge for about 30 minutes for the frosting to firm up. Keep remainder of your frosting for decorating. Meanwhile, make your ganache. Finely chop the dark chocolate and place in a heatproof bowl. In a small saucepan, add the cream and place on a medium heat until the cream is simmering but just before it starts to boil. Immediately pour the warm cream over the chocolate, cover the bowl with a plate and leave it to sit for 3-5 minutes. Then, whisk the chocolate cream mixture until smooth and creamy. Pop it into the fridge to cool and thicken up slightly – around 30 minutes. 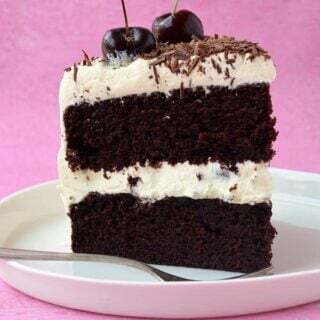 To decorate your cake, gently pour the chocolate ganache over the top, and use a small spatula to push drips over the sides of the cake. Leave to set slightly. Before serving, add dollops of mint butter cream to the top of the cake using a disposable piping bag and a large star tip. Add mint chocolate cookies and sprinkles. Enjoy. 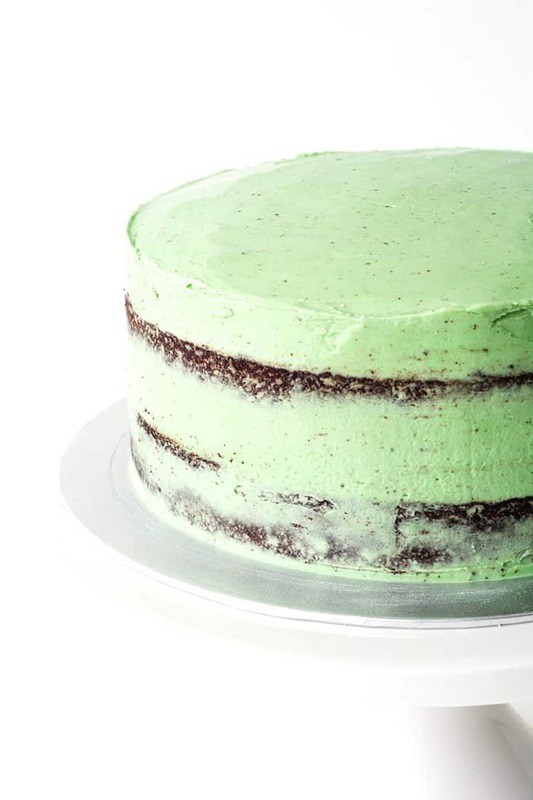 This recipe makes ALOT of mint buttercream frosting. This is to ensure there is plenty of icing to frost the middle and sides of the cake and also decorate the top. There’s nothing worse than running out of frosting halfway through and trying to make more that looks and tastes exactly the same. Love this recipe! 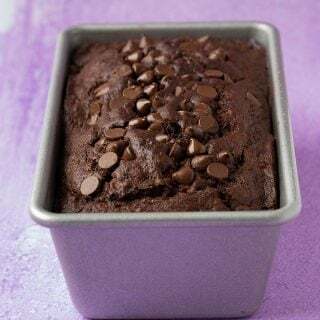 Cooked for my daughter ‘s birthday a year ago, but now I always use this cake recipe if I am ever baking any chocolate cake – it’s a winner! Wonderful! Glad to hear that Walidah! What a delicious cake! Loved the frosting too! 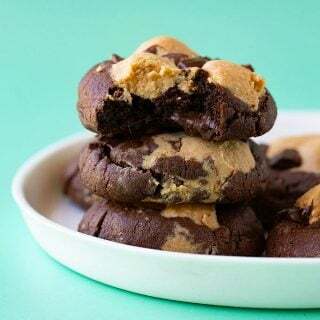 What cookies did you use for the topping? Hi Miranda! I used Arnotts Mint Slice biscuits. I love baking, however I’ve never had the guts to bake a real homemade cake before. Let me say, this is by far the best cake I’ve ever eaten. I’m a true chocoholic and this is amazing—Restaurant quality! The cake itself is not too sweet and the frosting matches perfectly. I will never buy a store-bought cake ever again. I reviewed so many compliments and many asked for the recipe 😉 Thank you for sharing this recipe!!!! Make this cake for my husband’s 30th birthday…. and was a complete success 😄 looked amazing and tasted even better…… he is usually very fussy with cake and I have never been able to cook a cake he has been completely happy with untill this one!!!! Thanks heaps for this recipe…… I officially have ‘wife of the year’ status because of it!!!! Hi Sam! Wow, thanks so much for your comment. I’m so happy your husband loved his birthday cake! You definitely deserve wife of the year status 🙂 Thank you for using one of my recipes!! I hope you enjoy it Chloe!! OH MY WORD! Jess! This cake looks incredible!! Not only super tasty, but also beautiful. I love the bright green just screaming "MINTY CHOCOLATE" at me. Who doesn’t love mint chocolate?! Enjoy the last year of your 20s! 30 is great– I promise! Happy belated! Happy birthday!!!! This cake is absolutely beautiful! I love the naked cake look and you’ve absolutely nailed it here with this tall and gorgeous cake! Happy birthday week!! It sounds like you are doing lots of wonderful things to celebrate! And this cake … looks incredible! 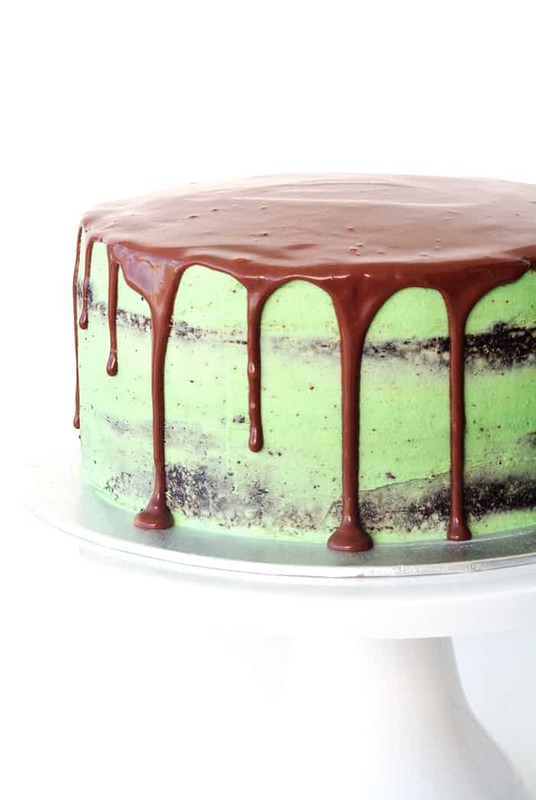 Mint + chocolate = the best! Happy birthday! I can’t think of a better birthday cake than this! It’s absolutely beautiful. Really stunning. 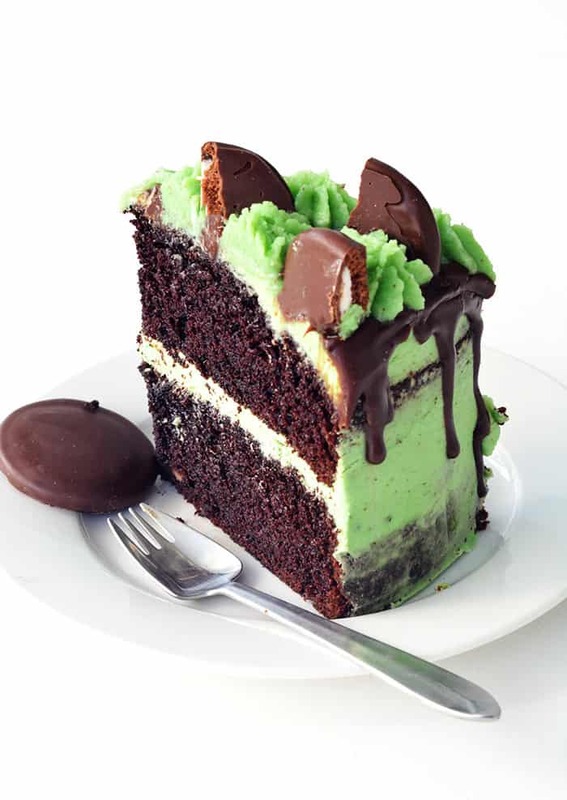 Mint and chocolate really is the best combination ever! What a beautiful looking cake! Thanks Kristy! I love mint and chocolate too! I love the look of naked cakes, they’re so gorgeous! I’m definitely going to look for a cake scraper too, I’ve been needing one. 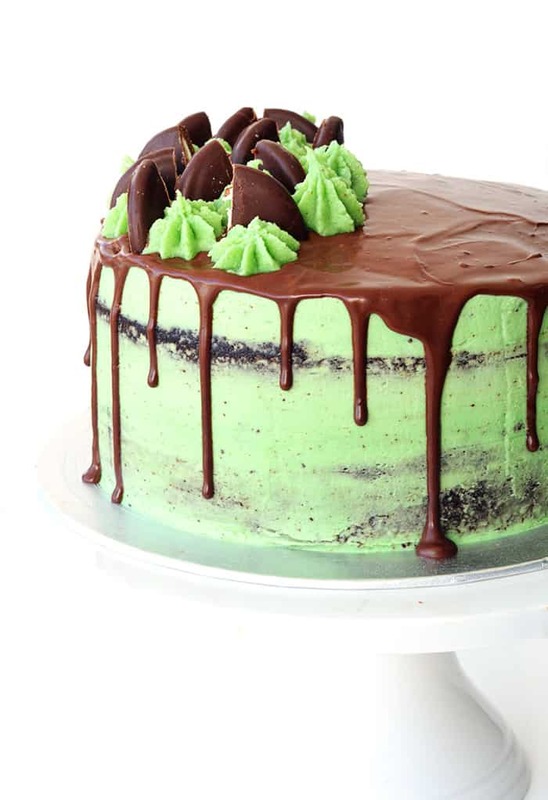 I love mint chocolate everything and this cake looks incredible. That ganache on top is so beautiful!